Need to stabilize some footage? 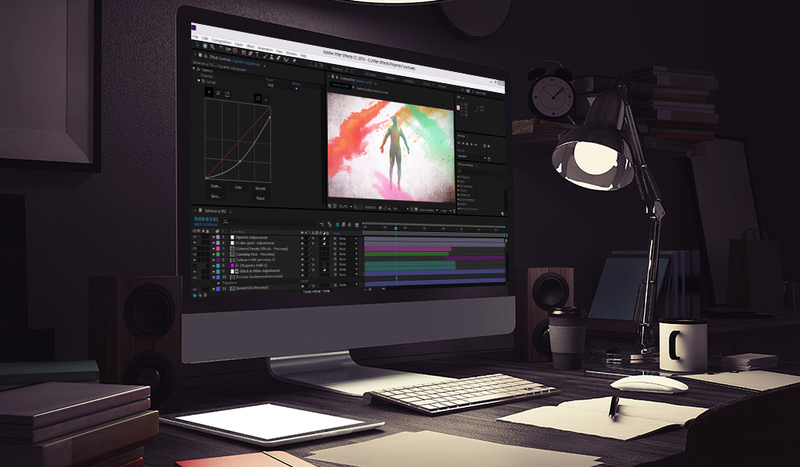 Here’s how to do it in Premiere, After Effects, and Resolve — and which program you should use. 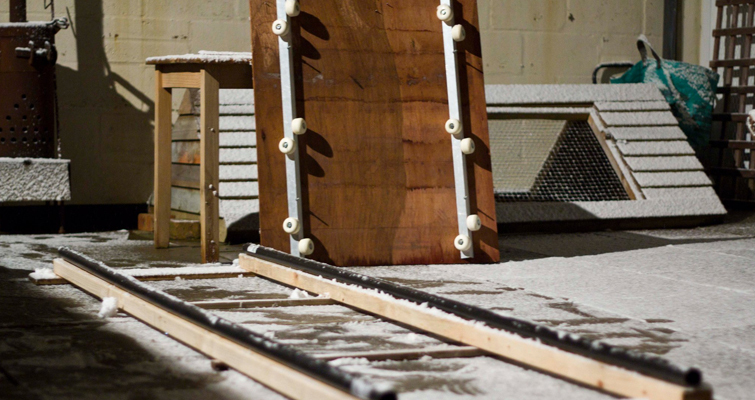 For a few nights in the cold winter of 2008, I spent many hours building the prototype of my DIY dolly and track. It was cumbersome, and it couldn’t collapse, so we had to carry around a 9-foot track, and the skateboard wheels often fell off. It was perfect. It got the job done; it produced a smooth tracking shot. 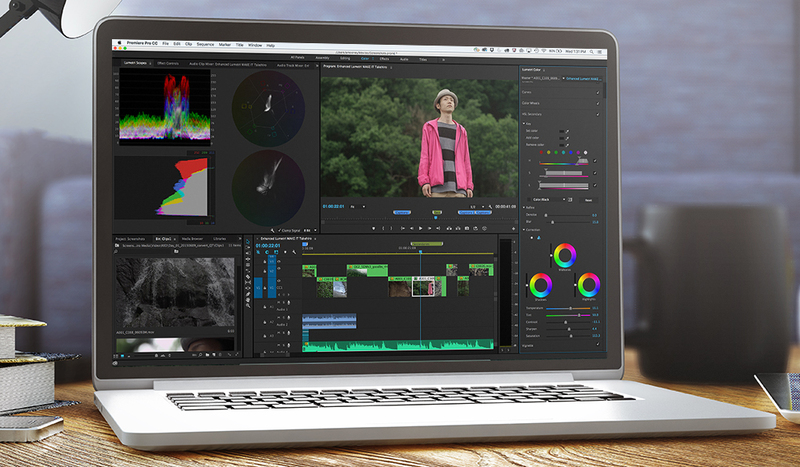 But what if you need to stabilize a shot in Premiere, After Effects, or Resolve? When you first start making films, from a technical standpoint, two things you’ll think will increase your production value are shallow depth of field and smooth motion. Whether or not the story is good, it will at least feel like a good film. SoFast-forward a decade from my winter adventure, and consumer-friendly dollies and sliders have become almost obsolete with the introduction of consumer-friendly gimbals and handheld stabilizers. And if that wasn’t enough, the advancement of software stabilizers has really changed the game. As I covered at PremiumBeat in “How to Make an Impromptu Shot Usable for Your Film,” with a steady enough shot, you can make your footage look like you shot it on a tripod. Today’s advanced stabilization algorithms are outstanding, and combined with improved image resolution and bit depth, it’s far easier to stabilize a shaky shot than it was a decade ago. However, what is a “steady enough” shot? And which program yields the best results? Let’s put these questions to the test with DaVinci Resolve 15, After Effects, and Premiere Pro. Before testing the stabilization tool in a variety of different circumstances, we first have understand the array of stabilization settings. While the terminology in After Effects and Premiere Pro differs from Da Vinci Resolve, often, the operations are the same. The methods you choose will alter how the software manipulates the image. Position: Analyzes the position data of the clip and adjusts the position to emulate a smooth image. Position, Scale, and Rotation: Stabilization based on the position, the scale, and rotation data. Perspective: Corner-pins the entire frame and tilts the image forward or backward to eliminate shake. In Resolve, starting from 14, there is an advanced stabilizer that combines both warping and image translation to remove — or at least minimize — unwanted shake. Resolve has always had renowned tracking and stabilization software, but for the past few years, it’s been even better than ever. In most circumstances, you can apply default stabilization to the clip, and with one click of the stabilization button, your clip will become smoother. Perspective: Enables perspective, pan, tilt, zoom, and rotation analysis and stabilization. Similarity: Enables pan, tilt, zoom, and rotation analysis and stabilization, for instances where perspective analysis results in unwanted motion artifacts. Translation: Enables pan and tilt analysis and stabilization only, for instances where only X & Y stabilization gives you acceptable results. The stabilization methods and adjustable settings in each program will only yield favorable results if they match with the camera movement of the clip. Subspace Warp is excellent for shaky clips with a lot of depth. Therefore, selecting Subspace Warp for an audition tape against a white background may yield a weaker result than just choosing Position. Still, before we can determine which program is the best, we need to look at the adjustments that can improve each stabilization technique. 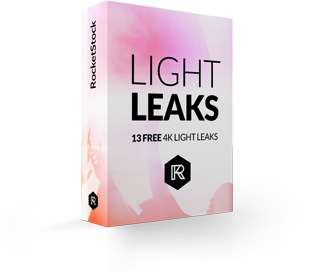 Again, Resolve has similar adjustable properties to After Effects and Premiere, but they may have different names. Smooth Motion: When camera movement is intentional, but it needs smoothing to reduce handheld shake. If the clip has camera movement — such as panning, tracking, or walking with the camera — apply this (note: this is the default setting). No Motion: Attempts to reduce or remove all camera motion from the clip. Depending on your shot, this often combines with extreme cropping, especially when used in conjunction with a still subject (see the example below for how the no motion setting has transformed the tilt shot into a static clip). In Resolve, you can find a similar function simply called Smooth. In the tracker window, you can increase the smooth amount from 0.25 to 1.00, which will eliminate the jitter (for the cost of cropping). Of course, when you hit stabilize set at the default 0.25, Resolve will still stabilize your shot, but it will retain more of the character of the initial shot. Sometimes, after stabilizing a shot, you may see black edges while the clip moves around because the stabilization is maintaining focus on a particular element in the frame. You can quickly correct this by increasing the scale of the video clip to eliminate the edges. However, there are also software options. 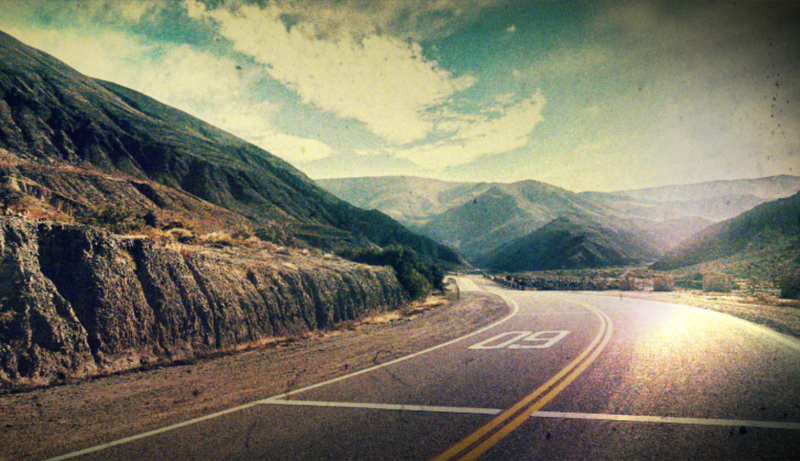 In DaVinci Resolve, there are two options: Zoom and Cropping Ratio. Cropping Ratio: Changes how much the stabilizer will stabilize the clip depending on how much zooming or blanking you’re willing to accept. Default is 0.25, and at 1.0, the stabilization is nullified. 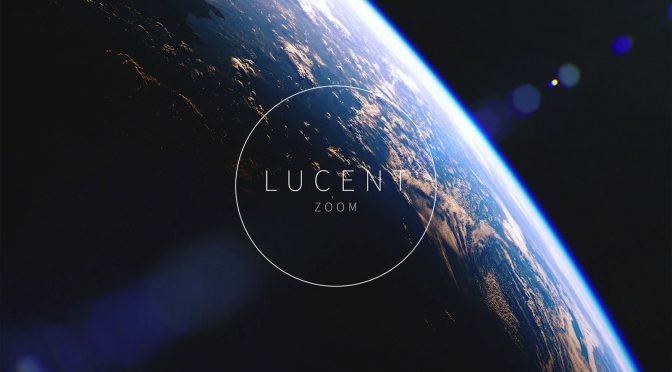 Zoom: Increases the image scale to eliminate any black edges resulting from warping or positioning. It’s important to recognize that these two settings work in conjunction. The lower the crop ratio value, the more Resolve will have to zoom into the image; the lower the crop ratio value with zoom unchecked, the more blanking you’ll see. In Premiere Pro and After Effects, you can find the framing options in their own dropdown menu. As with Resolve, these settings will affect the visibility of the edges. Stabilize Only: Displays the entire frame as well as the moving edges. Stabilize, Crop: Crops out the moving edges but without scaling the image. As a result, you may see an image that has a small amount of blanking in the corners. Stabilize, Crop, Auto-scale (default): Crops the blanking and increases the scale to refill the frame. Stabilize, Synthesize Edges: Fills in the blank space created from pixel data from adjacent frames (if you need to retain the full scale of the image). From here, you simply hit “stabilize,” and Resolve will do the rest. If the results aren’t satisfactory, you can use the information about the adjustable parameters to fine-tune the stabilization. Both Premiere and After Effects have the same stabilizer, and you can find the tool in the same place in both programs. To use the Warp Stabilizer in either Premiere or After Effects, you need to go the Effects Panel, and (confusingly) open the Distort folder. 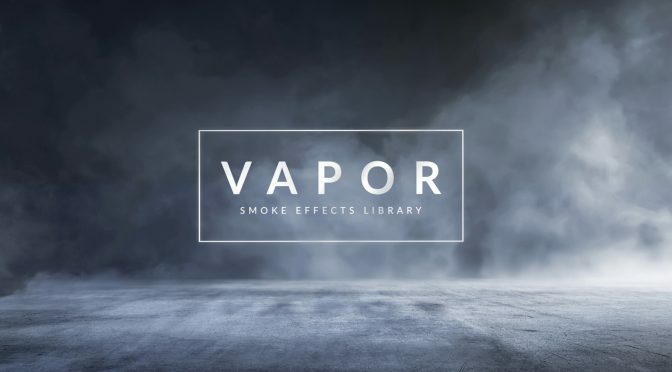 That’s where you’ll find the Warp Stabilizer VFX. You’ll need to drag the Warp Stabilizer onto the clip you want to stabilize. That means the Warp Stabilizer can become clustered when you apply it to a clip with multiple active effects. So, the question now is which program offers the best stabilization? 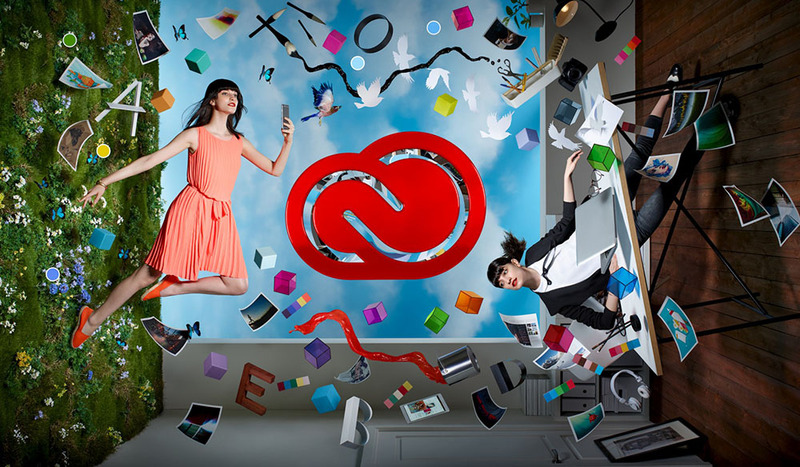 Well, Premiere and After Effects aren’t really competing with each other, so the contest is really Adobe vs. Resolve. First, let’s look at the speed of the process. We’ll be using a 4-second clip, shot at 24fps, and at a 4096×2304 resolution; we’ll also be using the default analysis settings. 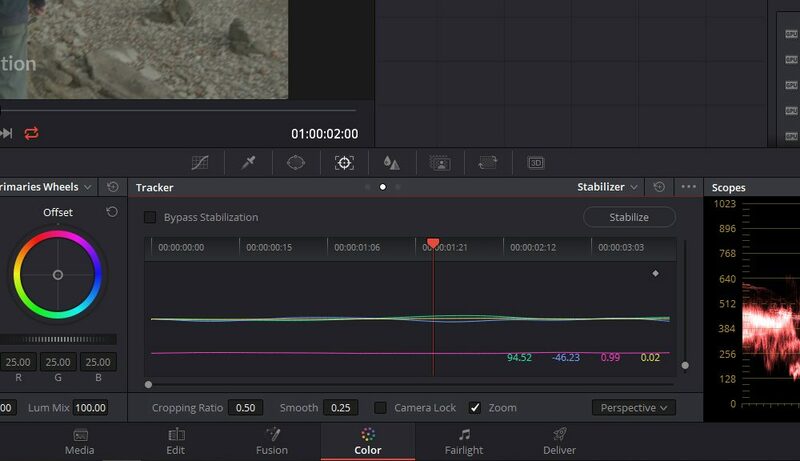 Resolve 15.2 analyzed and stabilized the clip in just 00:12.31 seconds. Premiere, however, took a whopping 575 percent longer at 01:23.18. (Side note: to confirm that Premiere and After Effects use the same stabilization, I ran the clip through After Effects, and the result was almost the same at 01:22.15.) There’s no denying the winner in this case. Although Adobe did take a leap forward when I changed one of the stabilization tool’s primary settings after the initial analysis. 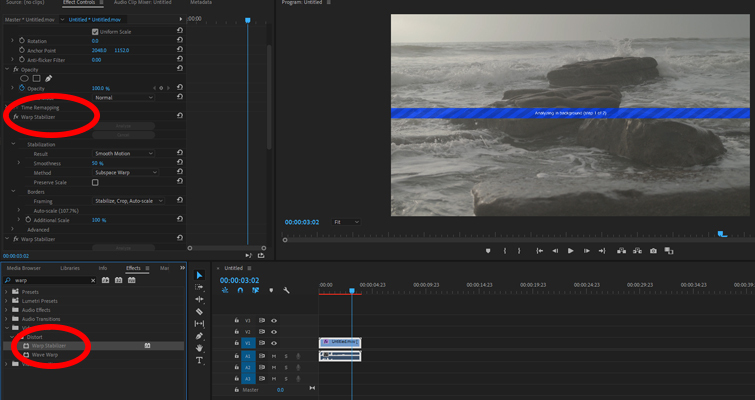 It takes a second or two for Premiere to adjust to the new parameters. But, in Resolve, you need to re-analyze and re-stabilize the clip after any adjustments — especially when changing the stabilization method. Which Program Has Better Default Stabilization? This is a vast area to cover. With so many variables , I’m sure you could find a way to make each program out-perform the others, given enough time. Time is often something editors don’t have a lot of, however, so let’s look at which program yields better stabilization after simply hitting the “stabilize” button. Using the same shot as before, the video below displays both results. The results are quite similar, and in some respects, we’re splitting hairs, but it does feel like Premiere’s stabilization is slightly smoother, even though both stabilization tools are set at 50 smoothness. However, we should note that Premiere’s extra smoothness costs us a small amount of compositional space. So what about default stabilization for a handheld pan? The original shot isn’t awful, but it would be nice if we could make it look like a pan shot by someone using a stabilizer rig. 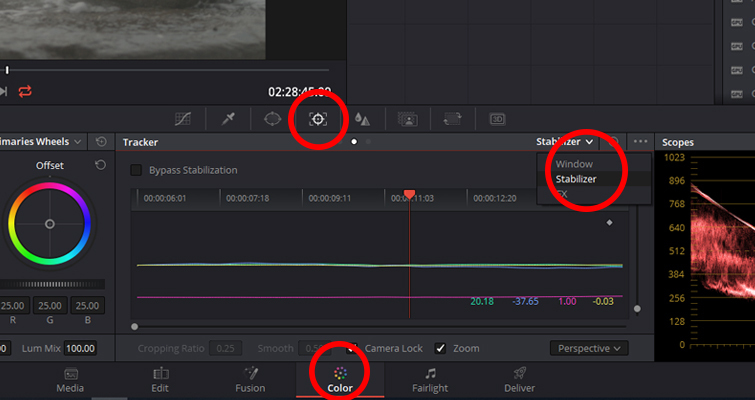 Resolve does claim to have a one-click stabilization tool, and I don’t think we can count it out of the race just yet. Well, Premiere certainly falls short here; there’s a fair bit of breathing and distortion, while Resolve has correctly exchanged the amateur turn for a handsome glide. It also looks as if Premiere has interpreted the pan as continuous motion and pushed it past the natural stop. Often, when we stabilize a shot, we don’t want to remove the movement; rather, we want to soften it. However, as I stated above, both Resolve and Adobe have options that can limit camera movement altogether at the cost of compositional scale. Reverting to the shot of the waves, let’s look at how Resolve and Premiere handle converting a shaky handheld shot to a static clip. Both Resolve and Premiere have removed 99 percent of the motion from the shot, and since it was a 4K clip downscaled to 1080p, the cost of scaling in to push past the blank edges is worth it. There is very minimal breathing in the Resolve stabilization, but Premiere limits the breathing altogether. Although, as you can see in the video, Premiere has had to rotate the video to do this, and since we can see the horizon in the background, it’s a really apparent adjustment that we will have to fix, which will cost even more compositional space. The big one. If everyone could follow an actor handheld and then stabilize it in post-production to make it look like a Ronin-M shot, a lot of companies would be going out of business. We will analyze two clips to see which program yields the best results. In the first clip with the man in a high-vis jacket, I was purposely rolling my feet to walk with a kinder bounce. In the second clip, I was walking normally. To counter high a chance of distortion, I’ve also reduced the smoothness to 25 for both Resolve and Premiere. Resolve has yielded a really nice result — there’s only the slightest jump near the beginning of the clip. Premiere, however, has produced less-than-satisfactory results. For the second shot, where I’m moving without trying to steady the camera, both Resolve and Premiere struggle with stabilizing the shot. Resolve walks away with a less distorted shot, but the sway is offputting. Premiere can retain focus on the subject better, but that comes with distortion that is too unpleasant to use. Is there a winner? I would say yes, and it’s Resolve. However, there are so many variables, and so many adjustable parameters, that I would also argue that either program can yield great stabilization; it just requires customizing the settings. You could ask two different people to film the same subject handheld at the same time from the same angle, and the differences in their height, body weight, and balance would produce different organic shakes. To close out, keep in mind that stabilization is a fix, but not for everything. There’s a reason why consumer-friendly gimbals still cost a pretty penny. Stabilization is just a bandage for a shot that came out too shaky; you shouldn’t use it as a replacement for a Steadicam or a gimbal. We’re still a good few years away from algorithms like that. On the flipside, it’s great to know that we have free and affordable software, and with one button, we can transform a handheld shot into something better.